The French Ministry of Agriculture has posted their latest update, adding 11 more HPAI outbreaks (primarily in Pyrénées Atlantiques and in Gers), since the last update issued late Friday Afternoon. Not included in this report are outbreaks of LPAI avian flu. Over the past 4 weeks France has reported at least 5 different types of avian influenza (HPAI H5N1, H5N2 and H5N9 along with LPAI H5N2 and H5N3). All five have been listed by the OIE as new strains, although we've yet to seen an detailed characterization of these viruses. Information on the subtypes reported over the past 3 or 4 days is not provided - listing these most recent outbreaks only as HPAI H5. After additional laboratory testing,we should learn which subtypes are involved, and eventually, something on the origins and lineage of this unusually diverse outbreak of avian influenza. Here then is the latest update from the French MOA. In total, to date, 53 of highly pathogenic avian influenza outbreaks in poultry were detected in 6 southwestern departments of France. - On December 4, in Cénac et Saint Julien, a flock of 1000 ducks and chickens 4000 was confirmed as a focus in the national surveillance program. The samples that were positive for H5 highly pathogenic for poultry were performed on ducks. The breeding was located in the restricted area of ​​Domme (surveillance zone). - A Nantheuil, December 7, 1000 a breeding ducks tested positive for highly pathogenic H5 in the surveillance framework in place for the release of animals from the restricted zone. - A Bosset, December 7, a flock of 630 ducks was detected as a result of clinical signs. - On 14 December at Bosset, an outbreak of H5N1 was detected in a flock of ducks 1070. - On 14 December, two outbreaks were reported in Campagnac-les-Quercy. The corresponding strains are being determined. - On December 15, as part of an output for slaughter, a summer home in St. Armand said Coly. The corresponding strain is being determined. - On December 18, on the occasion of a zone output for slaughter, an outbreak was declared Lardin Saint Lazare in the restricted area of ​​Montignac. The corresponding highly pathogenic H5 strain is being determined. - On 6 December in Doazit, following an abnormal mortality guinea (700 dead in 4000 hens), a farm was also confirmed as household (H5N9). Farming also has 8,800 hens, capons 4550 and 7200 keets. - On 9 December in Horsarieux, the H5N9 strain has been detected in a breeding of guinea 4000, 12,600 chickens, 3,500 ducks and 960 chickens capons. - On 14 December in Doazit, an outbreak of H5N2 was detected in a flock of ducks 1700. - December 14, 3 outbreaks were reported in farms on the occasion of a zone output for slaughter, in the communes of Saint Etienne d'Orthe (restricted area Josse) and Bergouey Monsegur (restricted area Doazit ). The corresponding strains are being determined. 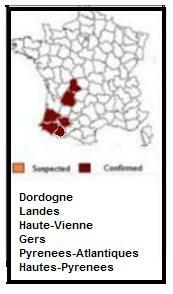 - On December 15, six highly pathogenic influenza outbreaks in poultry were reported on the occasion of a zone output for slaughter, in the communes of Momuy, Saint-Cricq-Chalosse, Montaut, Gaujacq, Serreslous-and -Arribans and Hauriet (restricted area Doazit-Horsarrieu). The corresponding strains are being determined. - December 17 on the occasion of an exit area for slaughter, four outbreaks were reported in the towns of Montaut Saint Sever, Aubagnan and Eyres Moncube. This is highly pathogenic H5 strains, finalizing their determination is ongoing. - On December 19, a highly pathogenic avian influenza outbreak was reported in Doazit at a duck farm. In Haute-Vienne, December 9, a single outbreak was confirmed in a poultry farm in Les Billangues. The identified strain is the highly pathogenic H5N1 in poultry. - An H5N2 outbreak was detected in a 10 December 8300 breeding ducks in Manciet. - A highly pathogenic H5 outbreak in poultry was reported on December 15 in a duck farm in Panjas, during a restricted zone output for slaughter. - A highly pathogenic H5 strain was identified 15 December 2015 in a breeding of ducks and guinea fowls 2000 in Mirande, following a clinical suspicion. Typing of the strain is being determined. - The highly pathogenic H5 December 3 17 influenza outbreaks in poultry were reported in ducks farms in the towns of Cazaubon, Eauze and Caupenne Armagnac. These clusters were identified as part of an output of animals for slaughter. The influenza strains for these cases are being determined. - On 17 December, a highly pathogenic avian influenza outbreak was reported in Averon Bergelle a duck farm. - A Arroses an H5N9 outbreak was confirmed on December 11 in a 1500 breeding ducks. - An outbreak of avian influenza highly pathogenic H5 was found Dec. 15, 2015 in Uzan in 1240 breeding ducks. - On December 18, two highly pathogenic avian influenza H5 were reported in duck farms in the municipalities of Maucor and Saint Jammes. - On 18 December, a highly pathogenic H5 strain was identified in Crouseilles a duck farm. - On December 18, a highly pathogenic H5 N9 influenza outbreak was reported in a flock of ducks Vialer. - On 20 December, three HPAI outbreaks were reported in duck farms in Navailles-Angus, Coslédaà-Lube-Boast and Escoubes. In the Hautes-Pyrénées, 1 case of highly pathogenic H5 influenza was detected 18 December 2015 in the town of Labatut-Rivière in a duck farm in the restricted area of Arroses. The strain is being determined. Another highly pathogenic H5 N2 outbreak was reported the same day in Ossun in a goose farm.